It seems that in certain machines I can do interslot calls in page 0 (i.e. CALLF does not switch itself out), in others CALLF commits suicide by swapping the rom page where it is. From the msx red book the it seems that RST 30h should work on any page, but maybe it is not guaranteed on any msx 1 machine or on msx2 and upper. Is there anyone who has investigated the point? What does the standard say on RST 30h? Look for "List 5.14 Using the hook". I already used in the ISR to call at page 0 with no problem. Then when required set Slot ID and Address and call it. That should work on any system. One is sony HB-F500P where the code swaps out itself. Another is the Victor HC-95A. I think the only conditions to use CALLF are Main-Rom (bank 0) and Main-Ram (bank 3) must be present in corresponding banks. Have you coded something with a routine in ram in page 0 called with CALLF? Rarely because we must write the slot ID in RAM. No, I do not have these machines but I think slots are well emulated. I can try it on emulator and on my MSXs. The last routine here also works. The problem was on computers that had the RAM at slot 0, the same than BIOS (another subslot). Using RST I’d not detected problems, but put it on another page than 0. Indeed, looks like both of those have RAM in slot 0. The MSX2+ standardises that built-in RAM should be in slot 3, so for software targeting MSX2+ or higher there should be no issue. Because if works on HB-700P but not onHB-500P , I compared the both Main-Roms. These are exactly same so if there is a bug, it is common (and probably with all the MSX Bios too. Sony HB-500P and Victor HC-90/95 have RAM in an extended Slot 0. Maybe RST 30h routine can not call to RAM in the area 0000h~3FFFh of an extended Slot 0. 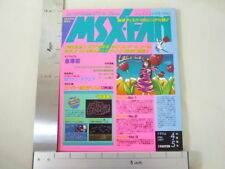 We should find the other MSX that have RAM in this area to confirm. A memory extension should fix it. This problem should not occur under MSX-DOS.